Pluto and Charon with SURFACE DETAIL! Being an enormous nerd, I’ve been following the New Horizons mission to Pluto since it was launched in 2006. I was in high school. (I used to be a teenager! Can you believe it?) I can’t imagine what it’s been like for the New Horizons team, waiting for nine years, most of that with New Horizons in hibernation, waiting and hoping. 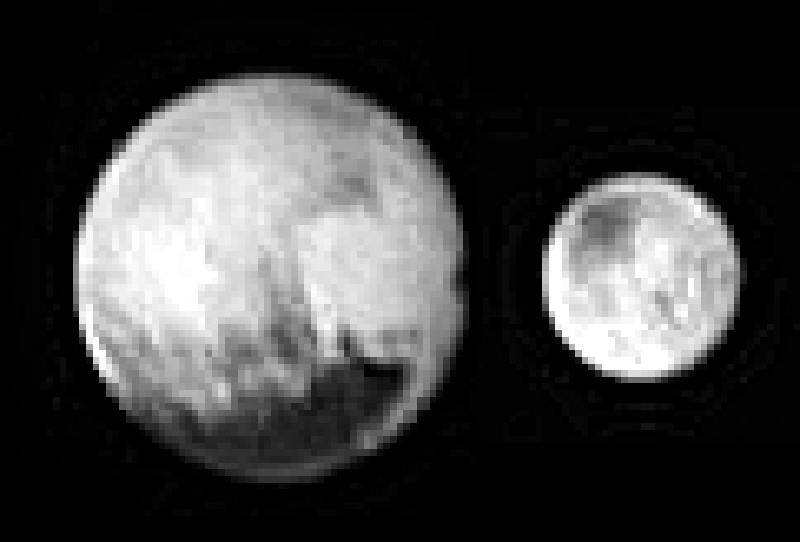 But, in spite of July 4th’s technical glitch, good old New Horizons is starting to send back some really cool images of Pluto, its big moon Charon, and its tiny moons Nix, Hydra, Kerebos, and Styx. Of course, in the days leading up to New Horizons’ July 14th, 2015 flyby of Pluto, my piddly little enhancements are going to be blown out of the water by real, up-close, high-resolution pictures. And you know what? I don’t mind a bit! → Pluto and Charon: Holy @#$%! we’re almost THERE! Cool! Unfortunately I heard relatively little about this until recently, so this has come as a big surprise to me. I guess that’s a good thing, though, in an odd way; I rarely get happy surprises because I try to minimize surprises. Should I savor this one? Thank you. Fair warning, though, I occasionally use swear-words. On the topic of New Horizons I wrote a post recently on the artefacts carried aboard the spacecraft in case it is ever uncovered by alien civilization in the long distant future, after it has left the solar system. I’m gonna put that post on my reading list. But I know one of the artifacts is a Florida quarter, which they used to balance New Horizons and make it spin-stable. Which is pretty cool.